Laparoscopic gastric sleeve surgery, or laparoscopic sleeve gastrectomy, is a minimally invasive procedure with a track record of positive patient outcomes. 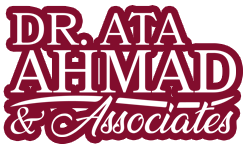 Dr. Ahmad and his staff are experts in this procedure and his Houston clinics are specifically equipped for this surgery. The procedure reduces stomach capacity while allowing the stomach to function normally. Patients can continue to eat most foods. Your surgeon will remove the portion of the stomach that secretes Ghrelin, a hunger-stimulating hormone. The procedure does not involve intestinal bypass, and there is minimal chance of developing obstructions, marginal ulcers, anemia, osteoporosis, protein deficiency and vitamin deficiency. High BMI patients will experience rapid and immediate weight loss. This procedure is an attractive alternative for patients who are concerned about foreign bodies such as the LAP–BAND. Key benefits of laparoscopic surgery include fewer wound and lung problems, less pain, and faster recovery. Patients should be overweight by approximately 100 pounds with a BMI of 40 or higher. Patients should not have a history of metabolic or endocrine disorders that cause obesity. Weight reduction surgery should yield objectively measurable improvements related to the patients’ physical, psychological, social, emotional, or economic health. The patient should be willing to commit to follow-up care and lifestyle modifications. The patient should have a track record of unsuccessful weight loss attempts. In some instances, patients who are less than 100 pounds overweight are eligible for the surgery. These patients are typically suffering from obesity-related conditions including heart disease, hypertension, and diabetes. 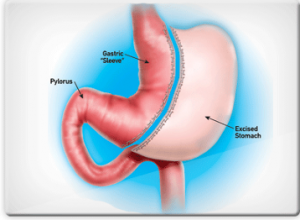 How Is Laparoscopic Sleeve Gastrectomy Performed? The advantage of a Laparoscopic sleeve gastrectomy is the surgery being performed through small incisions that leave almost no sign of scaring. This is an irreversible surgical weight loss procedure that reduces the stomach to 25% of its original size. Your surgeon will remove a major section of your stomach and then reattach the open edges to one another. During the procedure, we will remove the large, curved area of the stomach to create a small abdominal pouch creating a stomach tube by connecting the esophagus to the duodenum. The smaller stomach pouch will cause patients to feel full with less food intake. You will need a thorough medical evaluation from a physician to determine whether sleeve surgery is the right fit with your needs. You may need to undergo supplemental diagnostic tests including a nutritional evaluation. A psychiatric or psychological consultation may be necessary to determine whether the procedure is a fit with your emotional needs. Depending on your health history, you may need additional consultations from specialists including cardiologists, pulmonologists or endocrinologists. It is encouraged that you participate in a bariatric support group before and after surgery. After the surgeon reviews risks and benefits of the operation, you will need to provide a written consent. Days before surgery, you will need to start a clear liquid diet. Depending on your health history, you may need a blood transfusion or blood products such as platelets. Do not eat or drink anything after midnight the night before your surgery. You should work with your surgeon to determine which medications you should or should not take. You will need to temporarily stop drugs such as aspirin, blood thinners, anti-inflammatory medications, arthritis medications, and Vitamin E for several days to a week before surgery. Diet medication or certain herbal supplements such as St. John’s Wort should not be used for two weeks before surgery. What Should You Expect On Surgery Day? Be prepared to arrive in the hospital in the morning. You may need to wear a hospital gown for the duration of the procedure. A licensed medical staff member will place an IV needle and catheter into your arm to dispense medication during the procedure. You may need to take pre-operative medications as directed by your surgeon. Before your surgery, you will meet the anesthesiologist to discuss the medications you’ll receive while asleep. You will be asleep under general anesthesia for the duration of the procedure, which may last several hours. After the operation, you will be sent to the recovery room. When you wake up, you will be sent to your hospital room. Most sleeve surgery patients are hospitalized for several days until they are ready to return home.